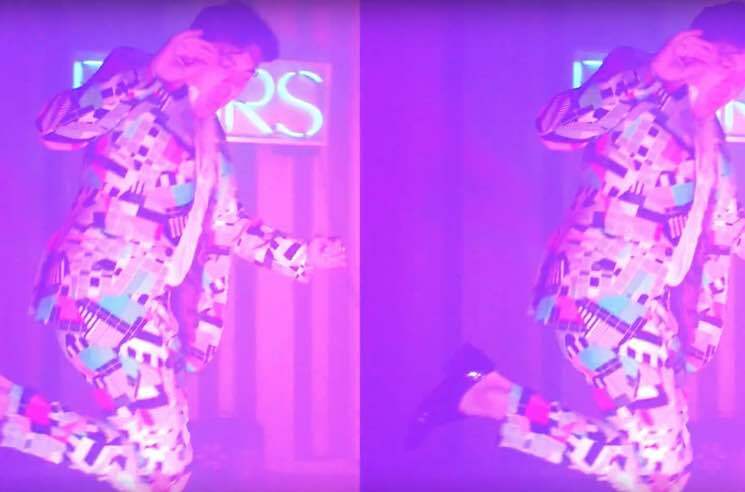 Emerging from an outfit formerly known as Boys Who Say No, Future Peers released their debut album under the new band name last year, and now another one of the tracks off the self-titled LP has been treated to a music video. Following up previously unveiled single "Ex-Teens," "Time We Went Away" is an exuberant, groove-driven tune that has been paired with a clip that's as fun and funky as the song itself. Awash in bright lights and dramatic fog, the band deliver their performance to the camera, with additional sparkly, cosmic flourishes added in the editing process. It was directed by Ryan Thompson. "We're not quite sure if Future Peers are holed up in a post-apocalypse bunker or the hull of a space ship but one thing is for certain, where ever they are these guys are having a blast," the band's Luke Corriea-Damude tells Exclaim! "The new video for 'Time We Went Away' focuses on the playful and positive vibes of a song that keeps you dancing and delivers a fresh take on pop music." See that energy get translated into the new video down below. If you want to experience the band's infectious sound live, you can catch them at their upcoming Toronto show at the Silver Dollar on April 21.